Sometimes your ageing dog seems less happy, occasionally experiencing age related conditions. Specially designed food is your ally to make him feel as good as he can be. 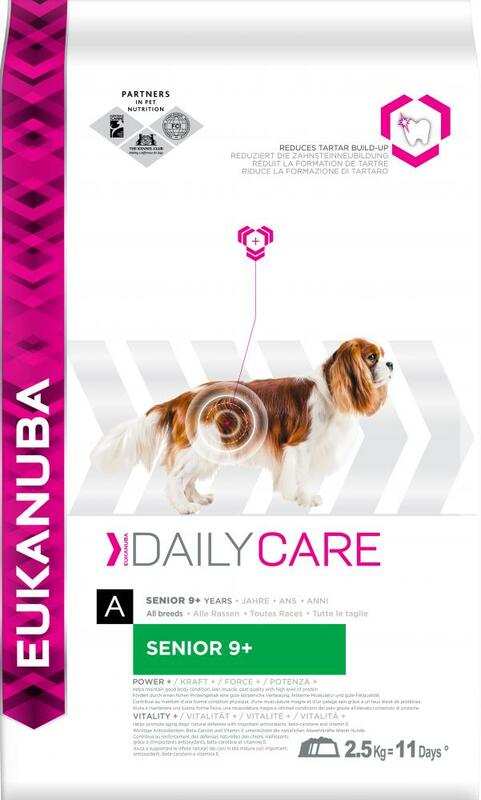 Daily Care For Senior 9+ from Eukanuba is a complete and balanced everyday diet for his age related predispositions. It has antioxidants to help maintain his immune system, prebiotic fibre for a balanced digestion and essential vitamins and minerals to get the support he needs. Keep feeding this carefully designed Daily Care for Senior 9+ nutrition. Maintain the diet that agrees with your dog! Recommended For: Senior dogs (9+ years). Vitamin A (45055 IU/Kg), Vitamin D (1495 IU/Kg), Vitamin E (250 Mg/Kg), L-Carnitine (56.9 Mg/Kg), β-Carotene (28.5 Mg/Kg). Contain Basic Cobaltous Carbonate Monohydrate (0.47 Mg/Kg), Cupric Sulphate Pentahydrate (45 Mg/Kg), Potassium Iodide (3.3 Mg/Kg), Ferrous Sulphate Monohydrate (597 Mg/Kg), Manganous Sulphate Monohydrate (45 Mg/Kg), Manganous Oxide (32 Mg/Kg), Zinc Oxide (207 Mg/Kg). Divide the daily amount shown in the feeding chart by the number of meals. Your senior dog may eat more or less depending on age, temperament and activity level. There are currently no questions for Eukanuba Adult Daily Care Senior Plus Dog Food - be the first to ask one!